I spent hours upon hours over four months looking for just the right compact that was economical, reliable, roomy, and fun to drive. The MINI COOPER stands out in all of my criteria but one. The homely little Mazda3 is like the girl you marry, well put together, comfy and good for the long haul. She's the one I brought home. 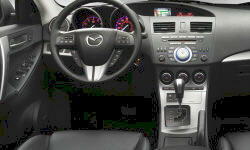 Why the 2012 Mazda Mazda3? Hard to beat 40 mpg in a car that drives as well and has the performance of the Mazda3. Most ZOOM ZOOM for the price of any car I test drove. It was neck and neck between the Mazda3 and the MINI COOPER. I had my heart set on the MINI, but reliability was the deciding factor. I spent countless hours researching vehicles over the last several months and was very dismayed at all the mechanical issues that plague the MINI. On the other hand the Mazda3 seems to be very much trouble free. I really wanted a MINI, but I knew its 'cool' fun to drive personality wouldn't be enough to overcome the reliability headaches I could expect. Another 'no brainer'....a loaded Mazda3 Grand Tour ing i for 2k less than a base MINI. Similarly equipped the Mazda would have been 6k less. Handling, braking and drivability just as good as a MINI at legal speeds during normal day to day driving. I'm 6'5" and fit very comfortably in this vehicle. There is enough adjustability in the seats and steering wheel to accommodate most anyone. 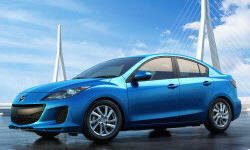 Why Not the 2012 Mazda Mazda3? Let's face it, just another cookie cutter compact. Not the quietest ride, but certainly bearable. Non of either if the front seats are all the way back, but rear seat room is NOT a factor for me.